Planning a birthday, anniversary or graduation party? You and your guests are sure to have a blast at any of our entertainment parks. From wacky mini golf to adrenaline pumping mini Indy-style go carting, heart-racing water slides, action-packed laser tag and video games, our exciting activities will make it a day to remember. Enjoy the entertainment, delicious food and warm hospitality without any stress. We take care of all the arrangements for large groups, including catering. If you are looking for a fun party venue, look no further than Golfland. It doesn’t get any better than this! Party Ideas for Birthdays, Anniversaries, Bachelorettes, Graduation, etc. Make one-of-a-kind memories with mini golf: Planning a family reunion or outing? Playing putt putt on our 18-hole world class course puts people of all ages in a great mood. Navigating our crazy twists and challenges brings out the wacky spirit in everyone. Cranky Grandpa Joe, grumpy Aunt Ann, little jumping Jack and tweeny finicky Fanny will all have a blast! It doesn’t matter if they have never played golf. You can even change it up to provide a unique experience for your family. See our mini golf ideas for more fun. Celebrate a milestone birthday at our action-packed games arcade: Children, teenagers and adults enjoy the eclectic mix of old favorites and the latest hits in our enormous games arcade. Whether the birthday boy or girl is turning 10 or 40, who can resist the thrill of chasing aliens, battling Kung Fu Masters and playing games of skill. Your group will be entertained for hours and players can redeem tickets for some fun keepsakes. 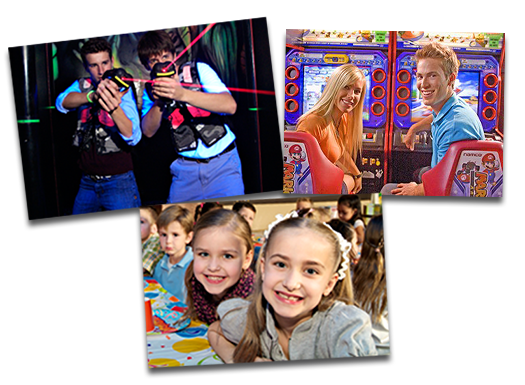 Plan a futuristic graduation party with laser tag: Show your new grad how cool you are by organizing a fun celebration in our real-life video game arena. The heart-pounding experience of shooting lasers and running for cover in our adventurous maze is a hit with both adults and children. Warning: They may not want to stop at just one game! Celebrate your anniversary with heart-racing go carting: Do something new and different as a couple or with your family and friends. Speeding around on our mini Indy style track will rekindle the excitement and bring you closer together. Chill before the wedding at our waterpark: A joint bachelor-bachelorette party at our waterpark is a cool way to get to know each other’s friends and unwind before the big day. A ride down our daredevil waterslides is a fun way to prepare for the ups and downs that are sure to come your way soon! Since 1953, Golfland has provided an affordable, fun place for families, corporate teams, fundraising groups, sports leagues, scout groups and more, to celebrate their special events or an outing together. Large groups love the convenient event planning and catering services provided by Golfland’s dedicated team. Click here to pick the right Golfand venue for your next party! Ready to have some fun? Click the button below to find a Golfland location near you! Golfland has been providing family fun since 1953! From thrilling water parks to our world-famous miniature golf courses, our locations have something for everyone. Golfland provides world class family fun in Arizona and California. Choose your destination above to see what our parks have to offer. We look forward to seeing you soon at Golfland!